Many of you may have noticed the “bumpy” paving around campus. 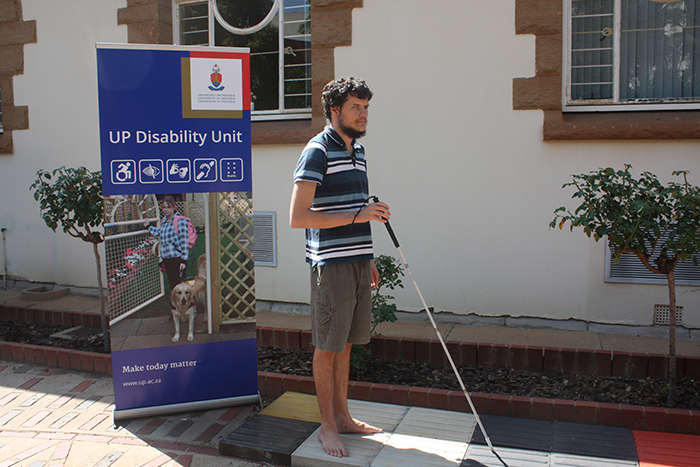 This is actually a collaborative project between UP’s Disability Unit and the Department of Facilities Management to have tactile paving installed around campus to allow students and staff with visual disabilities to safely navigate their way around campus. The tactile paving is painted yellow to give persons with low vision the high colour contrast they need to see objects easily. The pilot project to introduce the paving around UP campuses involved the installation of tactile paving tiles that are detectable by long cane or underfoot. These are meant to alert persons with visual disabilities of approaching streets, hazardous surfaces or gradient changes. The pilot phase was completed in 2017 and the route looped around the IT Building. The route was identified as a pilot project because the paving tiles could be tested on a variety of surfaces, elevations and different entrance types. The pilot phase also helped to show how the paving tiles interacted with existing underground infrastructure that has its own access points and coverings. The project then moved onto Phase 2 which was completed by the end of October 2018. This route connects Phase 1 with campus entrances to the bus stops in Duxbury Road, the Law Building, Centenary Building, South Street entrance and the Student Centre. Zak Claasen demonstrates how the tactile paving works with a long cane. Phase 3 of the project will connect Phase 1 and 2 to the Disability Unit, Merensky Library, Prospect Street entrance, as well as House Nala and Nerina residences. Maria Ramaahlo, the HOD of the Disability Unit said, “UP has an institutional commitment to ensure an inclusive learning experience for students with disabilities. So, the Disability Unit aims to create an enabling environment by providing support to students with disabilities. The number of students with disabilities registering at the University of Pretoria has increased dramatically over the past five years. Ramaahlo urged staff to be sensitive to the needs of students with disabilities. "The Disability Unit, in partnership with the University’s departments and faculties, helps to facilitate accessibility for academic requirements. So in effect, the support of students with disabilities is the responsibility of every staff member at UP, not just the Disability Unit. Therefore, it is requested that all UP staff members are considerate towards students and colleagues with disabilities. Zak Claasen – a Bioinformatics master’s student who regularly makes use of the paving route from the FABI buildings to the Informatorium – says the paving has helped him to navigate around the Hatfield Campus. He says when he first got to UP it was a bit overwhelming because the campus is big, noisy and has many people, which makes it a bit more difficult for people who are visually impaired to orientate themselves. However, he says the tactile paving has helped him navigate the “tricky” areas which have lots of twists and turns.